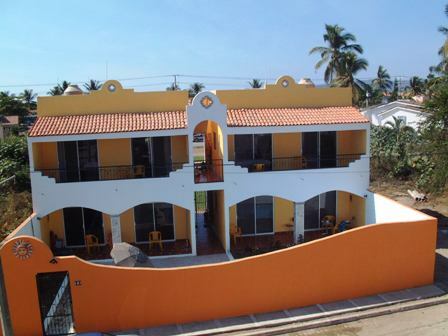 Condos for rent with swimming pool in Barra de Navidad, short walk to the beach. Casa Las Margaritas is located in Velero street with a parking entrance by Andres de Urdaneta street. Two blocks far from the Cabo Blanco Hotel. Barra de Navidad is located on the western coast-line of the Mexican state of Jalisco, 60 km north of Manzanillo and 300km south of Pto. Vallarta. From Puerto Vallarta is about 250 km. By Bus from Puerto Vallarta: It takes around 4 hrs. From Manzanillo is about 20 km. You can find good deals flying from Houston to Manzanillo or Puerto Vallarta with Continental Airlines. If you are visting Puerto Vallarta, Manzanillo or San Miguel de Allende we invite you to visit us in Barra de Navidad. Travelling by Bus (ETN or Primera Plus) from Puerto Vallarta takes around 4.5 hrs (250 km. ), or from Guadalajara 5.5 hours. From Manzanillo is about 20 km.